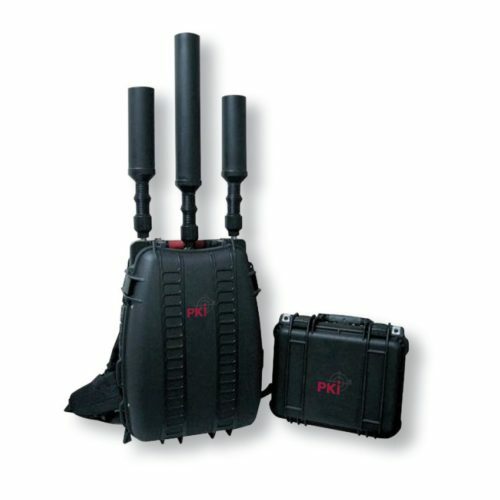 The PKI 6135 man pack jammer is indispensable for task forces like personal security or bomb disposal. Its configuration and power provides reliable protection against receiving or transmitting devices. The PKI 6135 can easily be transferred to the place of action by only one person and is deployable off-road and in buildings. Its powerful batteries provide network-independent operation on-site and in transit. The omni-directional antennas offer perfect jamming of transmitting signals. The PKI 6135 covers the frequency range from 20 to 2500 MHz virtually 100%. Further frequencies on request.